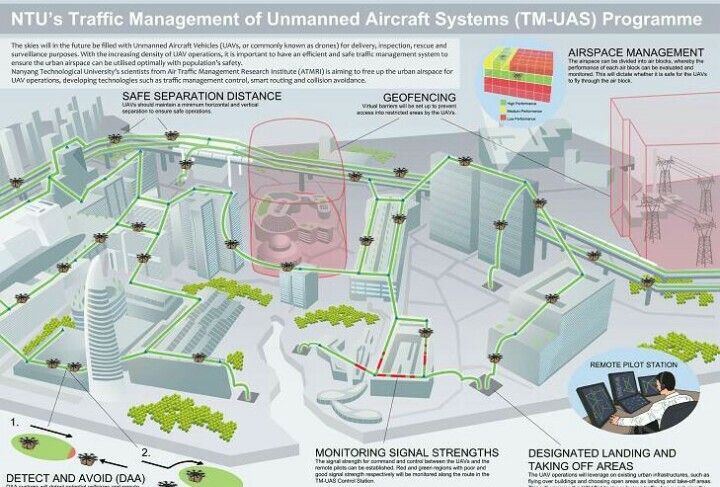 Nanyang Technological University in Singapore will develop an air traffic management system for drones, including built-in detect-and-avoid systems built, designated takeoff and landing zones, and virtual lanes through the city skyline. As drones take to the skies around the world, governments are scrambling to figure out how best to regulate them. The Federal Aviation Administration (FAA) has taken the matter very seriously, even releasing a holiday video encouraging new drone owners to register their vehicles before flying. And NASA successfully tested a drone traffic control system back in April. Now, Nanyang Technological University (NTU) in Singapore has followed suit with plans to develop a traffic management system to monitor the hundreds of drones expected to soar overhead in the coming years. Singapore is a technologically progressive city with a dense population and an expanding skyline. As such, officials there think it’s important for the city to implement an air traffic management system before drones overtake the skies. The Singaporean solution will be led by NTU’s Low Kin Huat and Mohamed Faisal Bin Mohamed Salleh. Among the proposed solutions are detect-and-avoid systems built into the drones, designated takeoff and landing zones, and virtual lanes through the city. “At NTU, we have already demonstrated viable technologies such as UAV convoys, formation flying and logistics, which will soon become mainstream,” Low said in a press release. “This new traffic management project will test some of the new concepts developed with the aim of achieving safe and efficient drone traffic in our urban airways. “The implications of the project will have far reaching consequences, as we are developing ways for seamless travel of unmanned aircrafts for different purposes without compromising safety, which is of paramount importance,” he added. At the top of the list is a system that can track the drones to check their speed and schedule traffic flows to avoid congestion and collision. They will also experiment with geofencing — a way to create virtual fences that route the drones around restricted airspace — while considering a legal system for regulation. “We will also look into proposing safety standards, for instance how high [drones] should fly and how far they should be flying above buildings, taking privacy concerns and laws into consideration, and to suggest recommended actions during contingencies,” Faisal said. The project is scheduled to last four years, with the first phase of design and simulations completed by the end of next year, and testing implemented in 2018. Next Next post: Will 2017 be the year we hail a flying Uber?